When you are in the process of development of the application, no matter what it is, you must check many lines of code, and if you make only one tiny mistake, your application may crush. One small typo can take hours or even days to find, because the file of the average size can contain approximately 400-600 rows. It’s not that easy to find one mistake in 600 lines of code without extra tools. You must stick to one coding style and make it understandable. In order to simplify the whole process of coding – professional website developers use IDEs (Integrated development environment). Many different IDEs exist nowadays for each unique goal and programming language. Usually it’s a tool-set which helps you to write, check and accelerate all frequently performed actions and reduce the time spent on development. It comfortably displays the structure of application, gives you a possibility to search for some piece of code in the numerous lines, and it’s very useful when you want to fix some bugs. Also IDE saves local history of your project, and you can see all changes for each file made by you or anybody, who shares the same repository. Besides, it has a smart autocomplete function, which seriously reduces the development time by completing all frequently used parts of the code like tags or methods, when you start typing. You can also connect to the server with the help of commands, create or delete files, change the same part in all selected files by your generated pattern, etc. 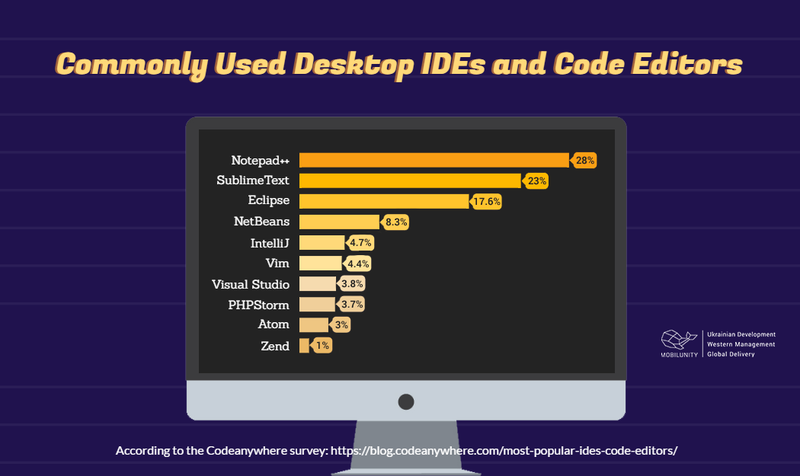 The most popular IDEs are provided by the JetBrains company. On their website you can find the development environment for all popular languages, with the best possibilities for your code deployment. If you are interested in the alternative IDE for mobile development or desktop variants, continue reading. Based on numerous resources, including Stack Overflow and Sitepoint, we’ve made the research of the best IDEs for Java, PHP, JS languages for desktop development, and Java, C++, C#, Objective-C, Swift – for mobile development, so that you could consider several solutions for your development process. IntelliJ IDEA by JetBrains embraces all the best features for code writing and editing, basic and smart autocompletion, provides suggestions according to the context, analysis and refactoring tools. Eclipse includes essential tools for coding on Java, which are Git client, XML Editor, Mylyn, CVS client, PyDev, Maven integration and WindowBuilder. It allows you to build and develop various cross-platform Java apps for mobile, web, desktop or enterprise domains. NetBeans is a free, open source IDE for Java development and other programming languages as well, which has a worldwide community of users and developers. PHPStorm is a smart IDE for PHP development, which supports all modern frameworks, rich functionality, including code completion, refactoring, error prevention, etc. Sublime Text. While being a great IDE for many programming languages, including PHP, it’s obvious that this one is very sophisticated and includes ridiculously-big number of add-ons, which allow you to make this tool even smarter. Atom is a modern and easy to use text editor, which can be customized as you like, thanks to the open access to the config file. It offers a quite convincing number of great functions set up by default. Brackets supports visual tools and preprocessor, and was made exactly for frontend developers and web-designers. Android Studio being the product of Google, helps to create native apps for every type of device with Android soft. In order to learn more about Android application development, check out our article! Eclipse is a great IDE for Java, and it has to be mentioned again, because it also does great job for C#/C++ languages in order to create apps for Android. However, it has to be customized to perform for 100%. XCode is an IDE, created by Apple and is used to create native apps for all Apple products. It has extensions to make your coding experience even more individual. While it’s free, you should know, that it can perform only on Mac. Overall, there are many IDEs, which can be used multipurposely, as you may have noticed from several examples above. Our programmers use the latest customizable IDEs with a big range of functions in order to deploy their knowledge and produce high-quality products. From the above mentioned our team uses: Sublime Text 3, IntelliJ IDEA, PHPStorm, NetBeans. However, there are several, which are also worth of mentioning additionally: Notepad++, Vim, Komodo, Aptana Studio, and Zend Studio. Hire smart Mobilunity developers, who save time on coding using IDE, and thus your time!